It’s smack in the middle of summer, in the middle of July, and our schools are still under a scalding sun. Playgrounds stand empty. Buildings are dormant. The bells haven’t rung for weeks. But if you stop to really listen, you’ll hear gardens at the Ann Arbor Public Schools buzzing with life. Many AAPS buildings have their own gardens, some which were born this spring. The blooming gardens, each as unique as their respective schools, boast everything from small basil plants to tall corn stalks –– and plenty of promise for fall harvest time. The gardens demonstrate a truly collaborative spirit. Grants and donations from the Ann Arbor Public Schools Educational Foundation, the Leslie Science Center, Agrarian Adventure, PTOs, local businesses and individual families all helped create the blooming spaces. 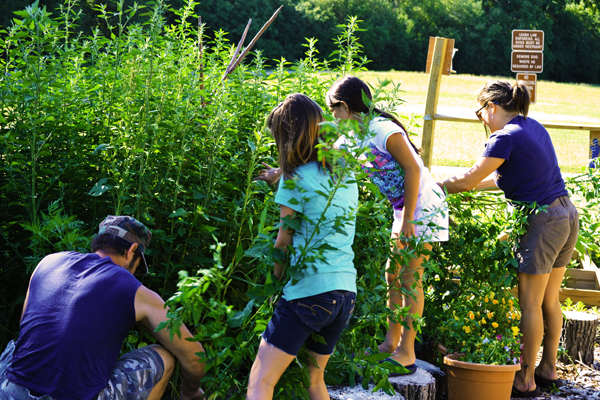 Volunteers from the schools and local neighborhoods help the gardens thrive. One warm morning last week, Carolyn Herrmann rode her bike with her kids Isabella and Sid to the King Elementary garden. 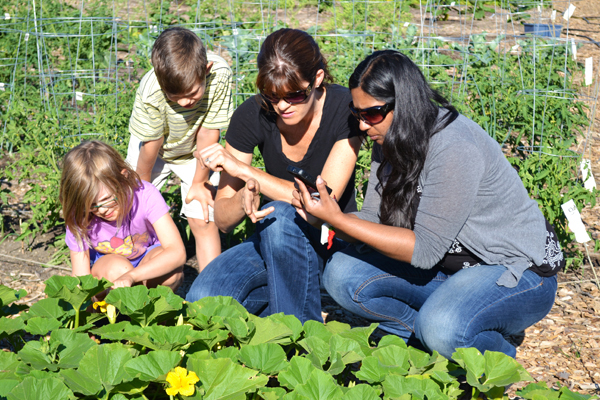 They were joined by Neha Shah, a fifth grade teacher who lead the creation of the garden this spring. Hermann, Isabella, Sid and Shah watered, picked weeds and fretted over tiny red-orange eggs laid in clusters on the expansive leaves in the squash garden. Shah used her smart phone to look up the eggs, determining that they were from the cucumber beetle –– which means trouble. They resigned to brushing the eggs off the leaves. The garden came together in a whirlwind work session Shah organized earlier this spring. Shah estimates that the garden now needs about 15 hours of attention each week for watering, weeding and seeding. Shah is excited for students to see the fruits of their labor when they come back this fall. 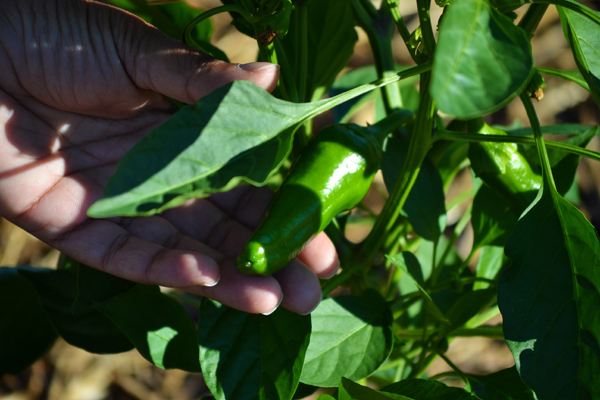 King Elementary teacher Neha Shah shows off a jalepeño. The new Pittsfield Elementary garden also benefits from a neighborhood full of volunteers. 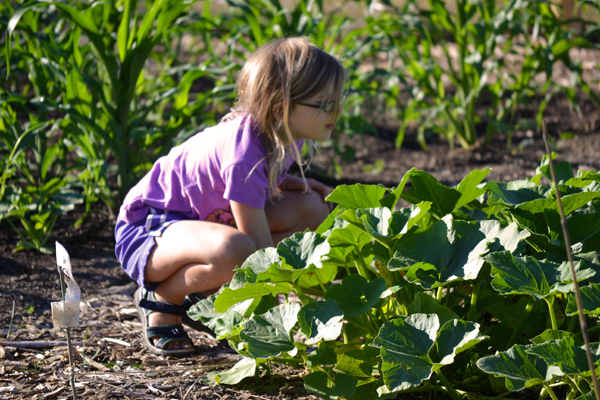 Jennifer Barcelata, a fifth grade teacher at Pittsfield, brought her daughter Marisol to the garden to pull weeds and put in woodchips last week. They were joined by Nathan and Sarah Gubachy, who showed up on their bikes. The group picked tall weeds that threatened to overtake a bed full of wildflowers. Sarah and Marisol, after figuring out what were weeds and what were flowers, thrust their weight against stalks, sometimes having to ask the grownups for help. King, Burns Park, Tappan, Ann Arbor Open, Northside and Pittsfield all have gardens created by individual teachers and PTOs. Project Grow, a nonprofit that creates organic community gardens in Ann Arbor, has also created gardens at Wines, Mitchell, Lakewood, Dicken and Clague. Lynda Norton, a parent volunteer who helps out in the Tappan and Burns Park gardens, just started a Google group for the school gardeners to network and support one another. If you’d like access to the Google group, contact Norton at llnorton@okno.com. If you’d like to volunteer for the King garden, use Shah’s garden website. To help out at the Pittsfield garden, contact Barcelata at barcelata@aaps.k12.mi.us. Of course they canThey exenedtd you credit and you didn’t repay them according to the contract (it’s like 5 or 6 pages that you have to sign to take out these loans, lots of small print that informs you they can report you if you do not pay) Depends on what the class action suit is about. The thing is, by the time the class action suit is ironed out, it would either be off your report (aged off) or you will be sued by them or the collection agency they sell your debt to, so it won’t matter.